The New Jersey Department of Environmental Protection (DEP), Historic Preservation Office and NJ Historic Sites Council are pleased to announce the 24th Annual Historic Preservation Awards. National Preservation Month happens every May. Throughout New Jersey, in all of our communities, there are important places that celebrate our history. These places are varied, such as schools, churches, battlefields, homes, or farms, but they all tell the story of New Jersey. In celebration of Historic Preservation Month, the 2014 Awards Ceremony was held on May 22, 2014 from 3-5 pm at the Prallsville Mill, Stockton, New Jersey. In 2005 the State of New Jersey commenced plans for the re-design and upgrading of the park surrounding the New Jersey State House. 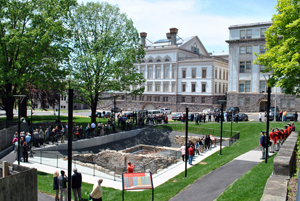 The Petty’s Run portion of the park project embraces a remarkable concentration of history and archaeology that lies buried within the sliver of land that extends south from West State Street between the State House and the Old Barracks. In the 18th and 19th centuries, the narrow gorge where Petty’s Run drops into the flood plain was the site of multiple water-powered milling operations, which were briefly overwhelmed by an episode of residential development in the 1870’s. The historical and archaeological importance of the site lies in its role as a critical focus of colonial and early federal water-powered industry in the Delaware Valley. Here are included the sites of New Jersey’s first plating mill and steel furnace, one of Trenton’s first cotton mills, and a paper mill developed in the late 1820’s. The site played an important part in the Revolutionary War, with the Continental Army being supplied with steel from the steel works and with gun barrels and bayonets from the plating mill. The site was formally opened to the public on May 14, 2013. It draws visitors on a daily basis and serves as a vital “new” heritage tourism asset that will assist in the revitalization of downtown Trenton as a tourism destination. 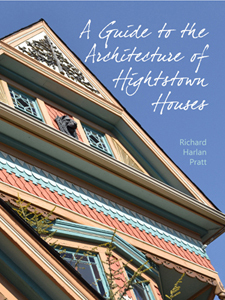 Author Richard Pratt, is a Hightstown resident, an architect, preservationist, local business owner, dedicated family man, and a serial volunteer. 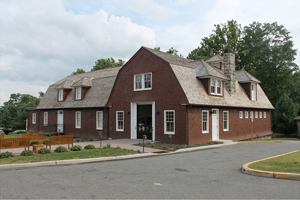 As a member of the local Planning Board, he commenced compiling design guidelines for the Hightstown Historic Preservation Commission to reference and educate local residents, as part of the Certified Local Government process. Those guidelines evolved into a reference book, and in 2012 he self-published the book and offered it for sale to the public. Its pages offer the history and growth of Hightstown, the ingredients of the styles of houses that exist in Hightstown, and parameters to guide one through maintenance, renovations, and additions to one’s home. As a life-long resident, author Jack Wasdyke was always interested in Saddle Brook’s past. It was a swampy farming community when he was a child, but it awoke in him an awareness of Native American artifacts in those years, and he began collecting arrowheads, hammers, knives and fishing net weights (banner stones). This all led to a lifetime of research and culminated in his appointment as Township historian in 1977. The end result of this interest and research was the writing and publication of the fascinating story of Saddle Brook from its prehistory to its present. Jack Wasdyke, a life-long resident of Saddle Brook, has always been interested in local history. As a child, he collected Native American artifacts: arrowheads, hammers, knives and fishing net weights (banner stones). His love of history led to a lifetime of research and culminated in his appointment as Saddle Brook Township historian in 1977. 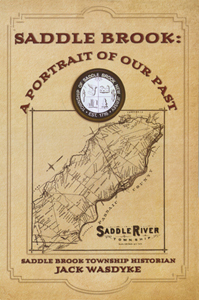 The end result of this interest and research was the writing and publication of Saddle Brook: A Portrait of our Past, the fascinating story of Saddle Brook from its prehistory to its present. The book goes well beyond the more typical collection of photographs and anecdotes, and provides a detailed history of the community. The book provides the context for a deeper understanding of how Saddle Brook evolved and came to look as it does today. The Old Atlantic County Jail, constructed in 1879, is the only remaining building of the original Mays Landing jail complex built prior to the 1984-5 construction of a new prison/courts complex. Despite its contribution to the Mays Landing National Register Historic District, the old jail sat empty for many years. Its roof had collapsed into the second floor and vegetation had taken root amongst the debris causing substantial damage to the remaining floors and walls. The project required complete structural stabilization, and the roof was rebuilt with salvaged wood truss members and cast iron connection components, and new regionally sourced lumber to replace missing or severely deteriorated elements. Missing exterior “Jersey Ironstone” wall stones were found and reinstalled into their original positions. The jail is now used for county offices, with the jail cell on the second floor restored as an interpretative jail cell museum element to explain the history of the site. to the New Jersey State Village for Epileptics. The mansion remained part of the village until mid-century when it became the Thomas M. Cooper Training Academy for the New Jersey Department of Corrections which housed a work release program for minimum security inmates. The mansion fell into dis-use in the last decades of the last century and was largely abandoned when Friends of the Homeless Animals viewed it for the first time in 2001. 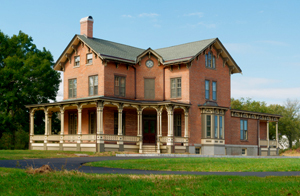 Cheryl Mills, President of FOHA, was able to purchase the mansion and its +/- ten acres in 2002, and restoration work slowly began on the building’s exterior. The entire project was completed in October of 2013. Built in 1915 and expanded twice in 1922 and 1953, the Lawnside School was built by the Center Township Board of Education as a permanent school building for the community of Lawnside, an early 19th century African American community incorporated in 1926 as the only self-governed African American municipality north of the Mason-Dixon Line. Throughout its history, Lawnside School played an important role in the community as its only educational facility and, in many ways, the center of community life. The school stands as one of the last remaining historic buildings that has tangible and intangible ties to the establishment and operation of Lawnside Borough. The Lawnside School, closed in 1982, is now the centerpiece of the Lawnside Senior Meadows community, a hybrid development that combines the sensitive rehabilitation of the school building with separate new construction to create a 40-unit affordable housing complex for Lawnside’s senior citizens. The project is a joint venture of the Borough of Lawnside, the Freeholder Board, Camden County Housing Association, Camden County Improvement Authority and Conifer Realty, LLC. Over the past two centuries, the architectural and agricultural heritage has been disappearing from the landscape of what is today Parsippany-Troy Hills. GlaxoSmithKline, a steward of one of the last remaining significant cultural resources in the community, realized this and committed its energy to ensuring a piece of that heritage, the Ballantine Barn, was preserved. The property had once belonged to Peter H. Ballantine of the well-known Newark-based beer brewery family. The remaining barn, now located on the corporate campus, is a highly visible icon and one of the treasures of the township that had fallen into disrepair. The historic barn was determined eligible for listing on the State Register of Historic Places in 1984, and GSK was determined to figure out a way to incorporate its conservation into the plans for its corporate campus. 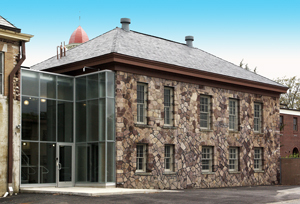 Although the building was deemed unsafe after a structural analysis, the Township and GlaxoSmithKline wanted the building to be saved and an adaptive reuse plan was set in motion to design a showpiece for historic preservation on the outside and a cutting-edge facility on the inside. GSK was sensitive to the fact that preserving the historical integrity of the building was a high priority and included the public with architect-guided tours throughout the project. The company spent close to a decade working to repurpose the building in order to make it an asset to the corporate campus and to ensure a future for the Ballantine Barn. Carpenter Gothic Style, but by the early 2000’s, the church began showing signs of age and deferred maintenance. In addition, the original configuration of the main entrance of the church had been altered and the steeple had been removed due to structural concerns. 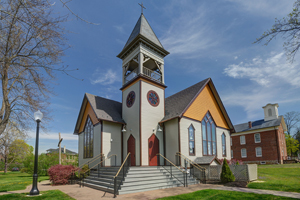 In 2008, the Trustees of the Port Colden United Methodist Church established a restoration timeline of the church building, based on a preservation plan, that would restore the steeple to its rightful place atop the bell tower, return the main stair to its original configuration, and remove the existing aluminum siding in order to rehabilitate the still-existing original siding and repaint it using an authentic poly-chromatic paint scheme determined through microscopic paint analysis. Work also included new roofing and copper gutters and downspouts. 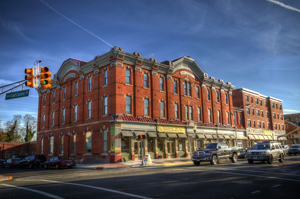 GG Green is a unique historic rehabilitation project that restored a local landmark, which was listed on the National Register of Historic Places, to serve as the an anchor for downtown revitalization. The building was constructed in 1880 as a 1,100-seat Victorian opera house, designed by local architect Paschal Medara and financed by patent medicine entrepreneur Col. George Gil Green. An embodiment of the city’s 19th century prosperity, it occupied an entire downtown block at the center of the thriving commercial corridor. It became vacant after it was listed on the National Register, and remained so for twelve years, allowing significant deterioration and water intrusion to occur. After suffering further damage from the earthquake of 2011, it was pronounced structurally unsound. A municipal request to demolish the building was approved by the State Historic Preservation Office. Local stakeholders and historic preservation advocates led an extensive campaign to save the opera house, and in 2011 RPM Development Group presented a proposal to the city to purchase it and adaptively reuse and rehabilitate the historic building to its original character. They acquired the site in 2012 and completed construction within 18 months. The project now provides 55 units of affordable housing for residents over 55 years of age, 7,000 square feet of street-level retail space, and a 3,500 square-foot community room, formerly the ballroom, available for public gatherings and events. 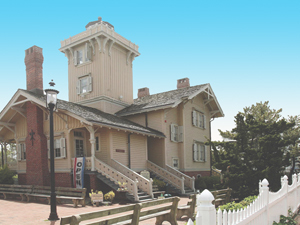 Phyllis Catanoso has served as the focal point for the preservation and reconstruction of the historic Hereford Inlet Lighthouse from the day it was leased to the City of North Wildwood on September 2, 1982 through present day 2014. It was through Phyllis’s volunteered time and efforts in conjunction with her inquiries dating back to 1963, which made it possible to secure the property via lease agreement between the City of North Wildwood and the State Department of Environmental Protection, the owners of the property. From 1964 – 1982, the lighthouse sat dormant, deteriorating, and uninhabitable, and used solely for storage, but Phyllis and a legion of volunteers invested time, expertise, and elbow grease that culminated in the completion of the restoration in June 2011. The Lighthouse stands today as a true symbol of preservation, and of Phyllis Catanoso’s dedication to the Lighthouse and to her community. Ice boats originated in the mid-1600’s in Europe and were used to transport cargo on frozen canals in the Netherlands. In 1869, the first ice boats appeared along the Hudson River as the winter recreation of affluent families with estates in the Hudson River Valley. 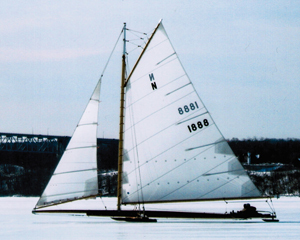 The “Rocket” Ice Yacht was constructed in 1888 and sailed on the Navesink River in Red Bank. It is one of the largest of these ice sailing vessels, measuring 50 ft. long with 900 square feet of sail area, and considered a Class 1 Ice Boat. The “Rocket” was stored under the North Shrewsbury Ice Boat and Yacht Club in 1923 and eventually donated to the club by the Coley family in 1924, but remained under storage for 50 years, where it suffered severe deterioration. The surviving parts were removed in the 1970’s, when work was initiated to restore it, but ceased after several years, unfinished, and returned to storage under the club. In 1998 a new effort was initiated and a crew of volunteers met every Thursday night to resume the restoration. After 15 years of work, the Ice Yacht “Rocket” was once again successfully launched on March 1, 2014.